FACT CHECK: Glyphosate Herbicide will Cause Half of All Children to Have Autism by 2025? Glyphosate Herbicide will Cause Half of All Children to Have Autism by 2025? Unsupported claims assert that one in two children will be autistic by 2025 due to the use of glyphosate (Roundup) on food crops. Claim: One in two children will be autistic by 2025 due to use of glyphosate on food crops. prognostication made “at a conference” in early December by Stephanie Seneff, PhD (whose web biography described her as a “Senior Research Scientist at the MIT Computer Science and Artificial Intelligence Laboratory,” not an individual specializing in epidemiology.) The precise location, date, and general scope of the December 2014 conference in question was not disclosed in the article, but a reference was made to the general subject of genetically modified organisms (GMOs). Of course, autism is a complex problem with many potential causes. Dr. Seneff’s data, however, is particularly important considering how close the correlation is — and because it is coming from a scientist with impeccable credentials. Earlier this year, she spoke at the Autism One conference and presented many of the same facts; that presentation is available on YouTube. AutismOne is a non-profit charity organization 501(c)(3) started by a small group of parents of children with autism. Parents are and must remain the driving force of our community, the stakes are too high and the issues too sacred to delegate to outside interests. AUTISM IS A PREVENTABLE/TREATABLE BIOMEDICAL CONDITION. 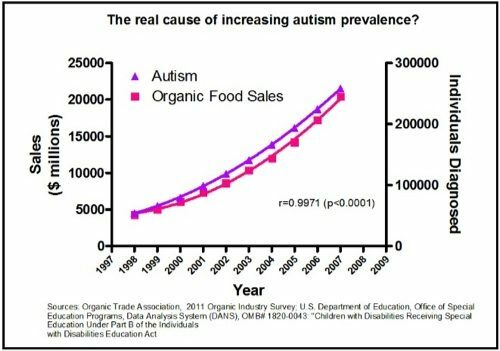 Autism is the result of environmental triggers. Autism is not caused by “bad” genes and the epidemic is not the result of “better” diagnosis. Children with autism suffer from gut bugs, allergies, heavy metal toxicity, mitochondrial disorders, antioxidant deficiencies, nutritional deficiencies and autoimmune diseases — all of which are treatable. The global prevalence of autism has increased twentyfold to thirtyfold since the earliest epidemiologic studies were conducted in the late 1960s and early 1970s. At that time, prevalence estimates from European studies were one in 2,500 children in the population, and by the 2000s prevalence estimates from large surveys were 1%-2% of all children. Although the underlying reasons for the apparent prevalence changes are difficult to study empirically, select studies suggest that much of the recent prevalence increase is likely attributable to extrinsic factors such as improved awareness and recognition and changes in diagnostic practice or service availability. the information in the article, it appeared Seneff’s claims rested on somewhat shaky foundations. Regarding autism rates in 2025, the “50 percent of children” estimate looks to be a rudimentary extrapolation of an apparent uptick in autism diagnoses in recent years. Particularly if the cause of such an uptick is improvements in screening and access to diagnostics, it’s just as likely the rate would plateau or even dip in the near future when considered by itself. No explanation was proffered (in the article, at least) to justify an affirmative belief the prevalence of autism would rise so drastically (and by that logic we might assume that by 2050, 125 percent of the population will be diagnosed with autism). Even disregarding the sloppy mathematics, the claim’s very basis (that glyphosate is the cause of a perceived increase in autism) is unsupported. No mention was made of how glyphosate was isolated and shown to be a cause (or even a factor) in some or any cases of autism in the article. No autism spikes near agricultural facilities were described, nor was any definitive causative link at all cited by the article (and presumably, Seneff) to back up the purported link between glyphosate and autism rates anywhere other than the imaginations of those making the claim. The single link of merit made within the article (to a USDA report) made absolutely no mention of autism at all but was misleadingly arranged to suggest a connection. Clearly the graph is tongue-in-cheek, but the sentiment is clear. Without peer-reviewed reproducible research, any number of factors can be blamed for what looks like a rise in autism rates. In actuality, scientists in a number of relevant fields have been working full-time to find real and provable answers to that question.